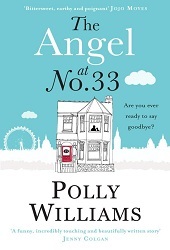 I had never read any books by Polly Williams until a lovely friend of my contacted me last week to say she had just finished a fantastic book and was going to send it to me, this book being The Angel at No33 by Polly Williams. I have to be honest if I had looked at this book in the shop I would have picked it up as I love the cover the colours that are used are very easy on the eye, but I think if I had read the synopsis I don’t think I would have read this book as I have read a couple of books where the main character is dead and I just didn’t find them enjoyable. This was not the case with this book though. We meet our main character Sophie just as she has been run over by a bus which sounds like a very morbid opening to a book but funny enough although Sophie has just died she manages to lighten the tone by making witty remarks so instantly I was gripped as I am one who enjoys a good bit of humour when it is least expected! Sophie cannot rest and watches over her loved ones and see them all cope in their own ways with losing a wife, mum and friend. We also get to see from the living side how each of the characters are dealing with their grief and we also start to get more of an insight to Sophie and Ollie’s relationship which it seems everyone was envious of. I found that although there was very emotional situations in this book especially revolving around Sophie’s son who not only is deeply missing his mum but also is effected by his dad who is always so sad, there were also some great down to earth humour, especially involving the local mums who are going out of their way to help Ollie but who often ends up with a number of similar gifts! Polly Williams has a beautiful writing style which manages to bring the emotions of each character out in the reader and it is a topic which is close to us all as we all would feel the same as Sophie wanting to know our loved ones were settled and safe before we can rest and I am sure most of us have all experienced a great loss and so can connect with Jenny, Ollie and Freddie. This book is definitely worth picking up as it will bring out all kinds of emotions and it is a real page turner. Thank you to Kayla for sending me this book with you enthusiastic recommendation!